Scan Holdings offers top quality Tinplate and Aluminium Easy Open Ends for food Cans, beer-beverage and non food products. Tinplate / Tin Free Steel Easy Open End with full aperture opening and partial opening are available in all sizes. These are also known as Tapas Metálicos. Our tinplate Full Open Ends (round, quarter club, oval, pear) are most suitable for tuna fish, tomato paste, vegetables, fruits, juices, etc., and also for dry packs such as coffee powder, milk powder, cereals and nuts. Aluminum Easy Open Lids for beer & beverage are available in Ring Pull Type, Stay on Tab (SOT Easy Open Ends) and Large Opening Ends (LOE). Our SOT Lids / Stay on Tab Beverage Ends and LOE can be made available for packing carbonated beverages & pasteurized / retort / sterilized juices. Also on offer are Aluminium Safety Feature Covers for packing milk powder & coffee powder. All our ends are available at competitive price. We can offer complete range of EOE/EZO in round, oval, quarter club, pear and rectangle shape. 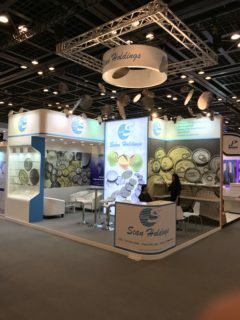 Scan Holdings offers the food industry Steel (Tinplate / Tin free Steel) and Aluminum Easy Open Ends for Food Cans and other types of metal and composite Cans. Also known as EOE, EO Ends, EZO, Tapas Metálicos, Easy Open Covers or Easy Open Lids, we offer complete range in all sizes and different shapes. Please read below to check complete details of ‘Tinplate / tin free steel’ ends, Aluminum EOE, Beverage ends and Evaporated milk EZO that are offered by us. Kindly remember that new sizes get added regularly. So if you do not find the size that you require below, please take a moment to write to us at scan@scanholdings.com . It will be our pleasure to update you on availability and answer your queries. Steel Can Ends are available in tinplate (ETP) and tin free steel (TFS). These EZO Ends are available for packing Tuna fish, tomato paste, fruits, vegetables, juices, curry vegetables, meat, mushrooms, nuts, milk powder, coffee powder, pure ghee (desi ghee), vegetable oils, motor oils and almost all other type of food and non food products. These easy open lids are available in ‘full aperture opening’ and also ‘partial opening’. Easy Open Covers are available in round, oval, pear and rectangle shape. Ends suitable for pasteurization / sterilization / retorting are available. Supplies are made conforming to customer request for client specific usage. Outside of the EOE can be gold lacquered or clear lacquered. It is also possible for us to supply EZO that are printed with opening instructions. Many of our customers purchase easy open ends with their logo printed on outside of these Can Ends. 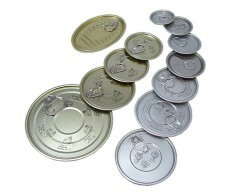 Such printed Can ends are commonly used to increase brand awareness and for running promotion campaigns. Inside of the Easy Open Covers are usually lacquered. The type of internal lacquer can be epoxy phenolic, organosol or aluminized as per customer request and end application. The color of internal lacquer can be Gold or Clear. All the lacquers used in our lids are approved by relevant authorities. We also offer tinplate EZO in irregular shapes like oval, pear and rectangle. Quarter Club is one of our most popular sizes that is available. Please write to us to check the availability of specific size that you require. Important: In case any customer requires, many different sizes in small quantities, we can supply mixed sizes of tinplate Easy Open Ends in one container load. For smaller requirements, LCL loads are sent through sea-shipment. Aluminum Ends are available for packing milk powder, coffee powder, nuts, seeds, motor oils and variety of food and non food products. Certain sizes of ends have ‘Safety feature’ which avoids the cut / wound when taking out the material packed inside the Can. All these EOE are available with full aperture opening. Our ‘aluminum easy open covers’ are getting exported all over the World at competitive price. Outside of the ends can be gold lacquered or clear lacquered. It is also possible for us to supply EZO that are printed with opening instructions. Many of our customers purchase easy open ends with their logo printed on outside of these Can Ends. Such printed ends are commonly used to increase brand awareness and for running promotion campaigns. Inside of the ends are usually lacquered. The type of internal lacquer can be epoxy phenolic, organosol or aluminized as per customer request and end application. The color of internal lacquer can be Gold or Clear. All the lacquers used in our ends are approved by relevant authorities. 50 mm (200 diameter) full aperture opening Can EOE for packing retort & non-retort food products / non food products. 52 mm (202 diameter) full aperture opening Can EOE for packing retort & non-retort food products / non food products. 63 mm (209 diameter) full aperture opening Can EOE for packing retort & non-retort food products / non food products. Our range on offer includes all types and sizes of high quality aluminium beverage ends that are required by the industry. We offer Stay on Tab Beverage Ends (SOT ends), Ring Pull Tab Beverage Ends (RPT ends) and Large Opening Beverage Ends (LOE ends). Aluminum beverage ends suitable for packing both; carbonated beer-beverages and pasteurized / retort drinks like juice and milk are available with us. This is a profile specially developed for Evaporated Milk Cans. Size: 63 mm (209 diameter); RPT Partial opening Can End for packing beverages/ juices/evaporated milk.